I haven't managed to write in a very long time. I wouldn't have even written in a long long time, given the surreal pressure of being Piled Higher and Deeper. But here I am, almost in the middle of the night, trying every possible trick in the world to keep the mind off the pure evil that's sitting right there on the kitchen counter and silently laughing at my misery. I call it my nemesis. Officially though, people call it Nutella. It was exactly three years ago that I had my first tryst with this sinful hazelnut spread. I had thought, "well it's made of hazelnut, how much bad could it be?" It tasted breathtakingly good, insanely addictive, was promoted as a healthy breakfast spread, and was consumed by a wide mass of people. So I convinced myself that it was definitely not something to be worried about. Initially, nothing happened. 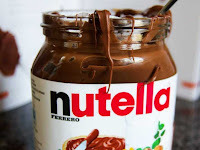 I kept on buying jar after jar of Nutella and spreading it on breads, crackers, fruits, and anything I could lay my hands on. Eventually, they gave way to spooning out dollops of the spread right off the jar and putting it in the mouth, and even more stacking of empty jars in the kitchen. Three months later, clothes started getting tighter. The zipper of the favorite pair of jeans wouldn't close. And people started commenting on how "fuller" my face had become. I didn't pay much attention, until I weighed myself one night at a friend's dinner party who happened to have a weighing machine at hand. 12 kilograms more than the usual weight, it told me. At first, I thought the machine was broken. But it wasn't too long before reality hit me. I remember crying that night, on my way back, and promising myself never to let that devil wreak havoc in my life! Ever. It has been three years since then. I have lost all that weight, followed a healthy lifestyle, gained wisdom and a hell lot of experience. However in all these years, except for a few Nutella crêpes here and there, never did I once let myself be rendered helpless at the hands of that particular spread. Until, recently. Three days ago, I went to the supermarket to buy the weekly grocery. It was cold and gloomy and dull and everything bad in the world and I was craving for something that would lift up the spirits in a jiffy. I browsed through the racks for more than fifteen minutes, but didn't find something that would make me go weak in the knees. And then, my eyes fell on the familiar brown jar with the white cap. I looked away instantly, knowing how fatal the attraction could turn out to be. But in the end, I found myself picking the jar up and proceeding towards the cash counter, and returning home with a smile I had forgotten I smiled.